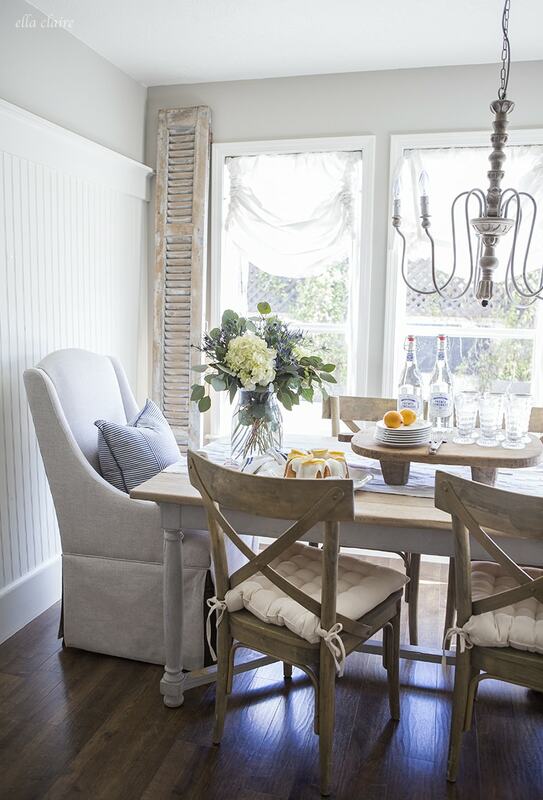 Glean some clever spring decorating tips on how to create a beautiful and budget friendly spring dining room! Spring is finally in the air and Easter is right around the corner! 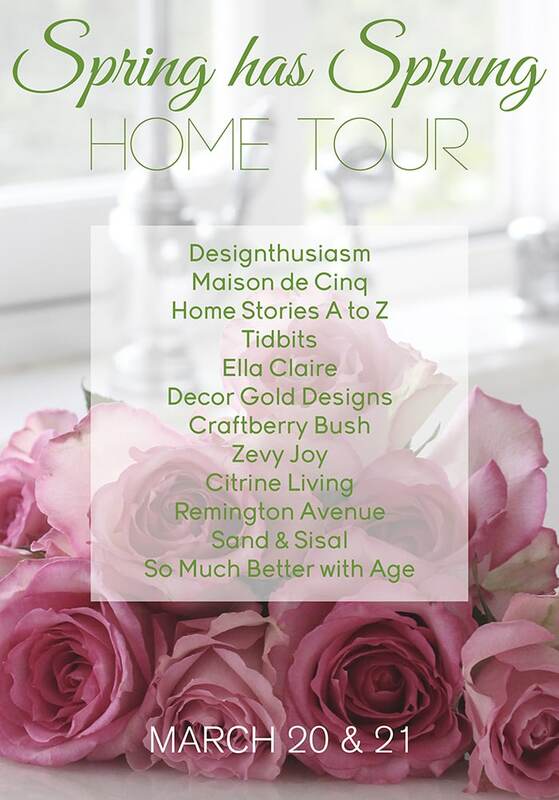 A special welcome if you are visiting from Maison de Cinq in today’s spring blog hop! 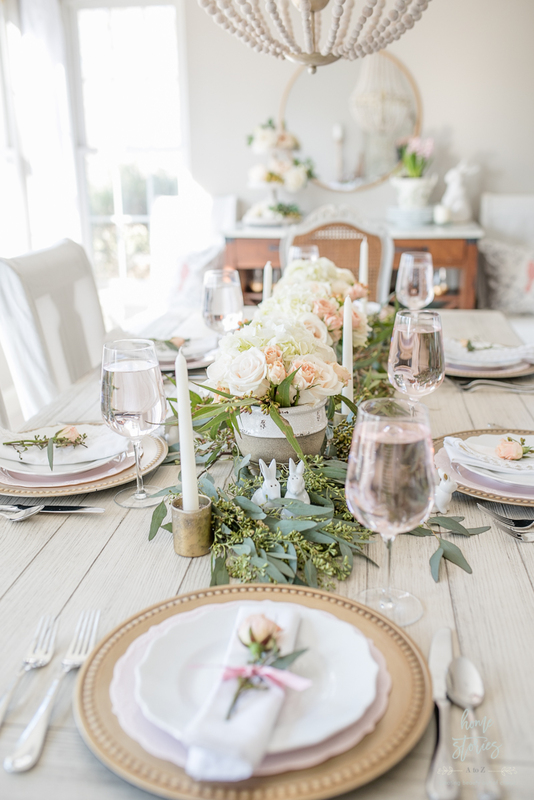 Decorating a beautiful spring table does not have to cost a fortune or take all day. 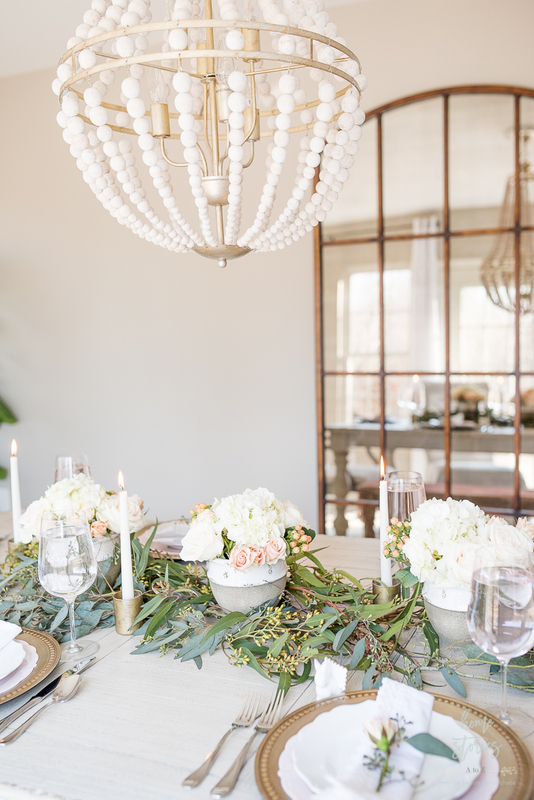 In this post, I’ll share my best kept secrets on how to create an elegant spring table for less. 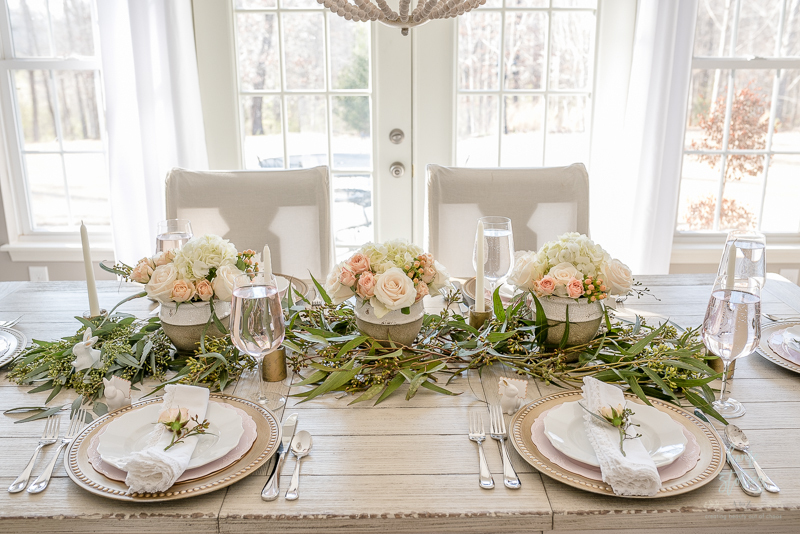 Spring Table Decorating Tip 1: Use grocery store flowers to create a live table runner. I love fresh flowers, but I don’t love spending a fortune on them. Our Trader Joe’s sells seeded eucalyptus for $2.99 a bunch and hydrangeas for $5.99 a bunch. I think the roses were a little more expensive at $9.99, but you can see how many I was able to buy at that price! If you don’t have access to a Trader Joe’s near you, check out your local grocery store for floral options. 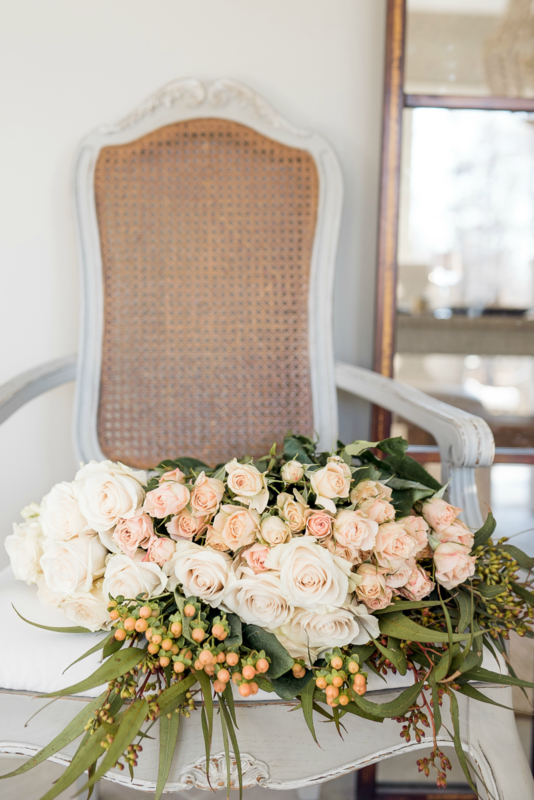 They tend to have beautiful blooms for a fraction of the price of floral shops. Walmart is also a great option. The potted pink hyacinth in the background is from Walmart and was only $5! 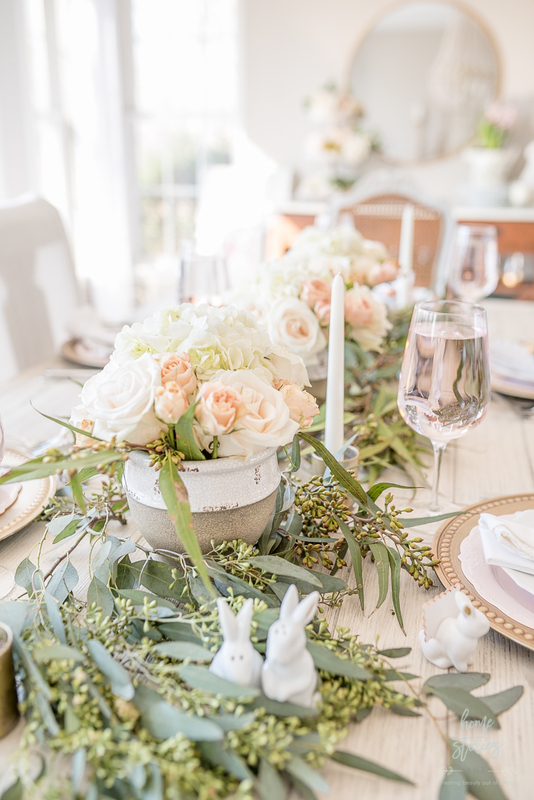 Placing greens, such as seeded eucalyptus, down the center of the table to create a live runner is a great trick to use year-round. Seeded eucalyptus looks beautiful, dries nicely, and doesn’t cost much to purchase. 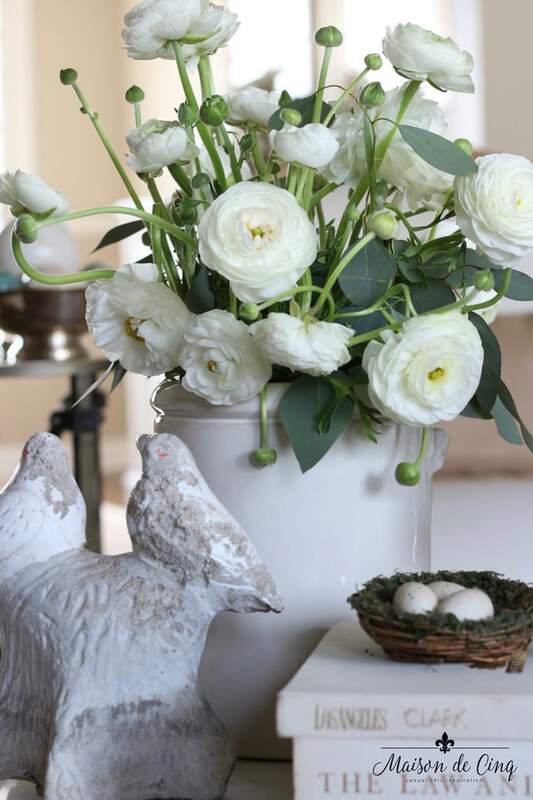 Spring Table Decorating Tip 2: Create several small flower arrangements instead of one large one. Tall and full centerpieces are lovely but don’t make for great eye contact across the table. Instead, I like to utilize several smaller arrangements to fill the table. Here I used three cute flower pots that only cost $5 each. Shop for them here. 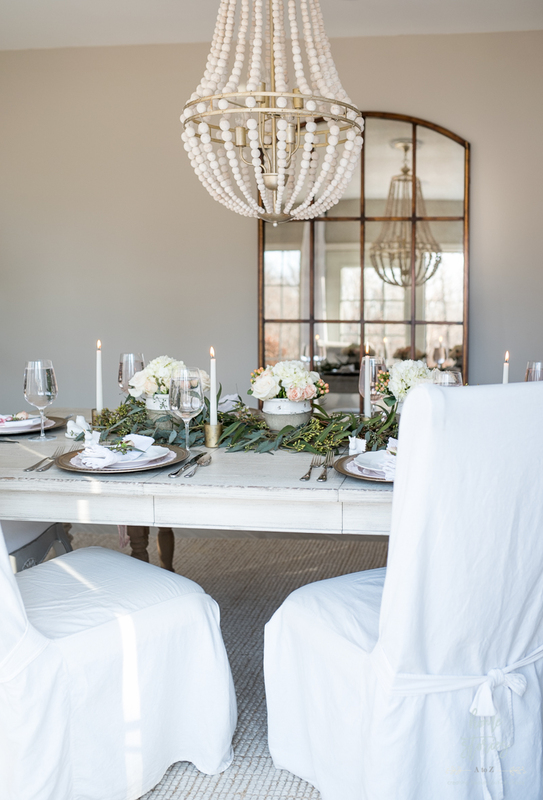 Spring Table Decorating Tip 3: Fill in your tablescape with candles to create inexpensive ambiance. Dining by candlelight is always romantic! In lieu of stick candle holders, I improvised by using painted gold votive candle holders. Click here to find the tutorial on how I made inexpensive glass votives into these gold mercury glass votive holders! Tip: To prop up the stick candles inside the votive holders I used chia seeds. You can also use quinoa, birdseed, pebbles, or whatever else you have on hand! 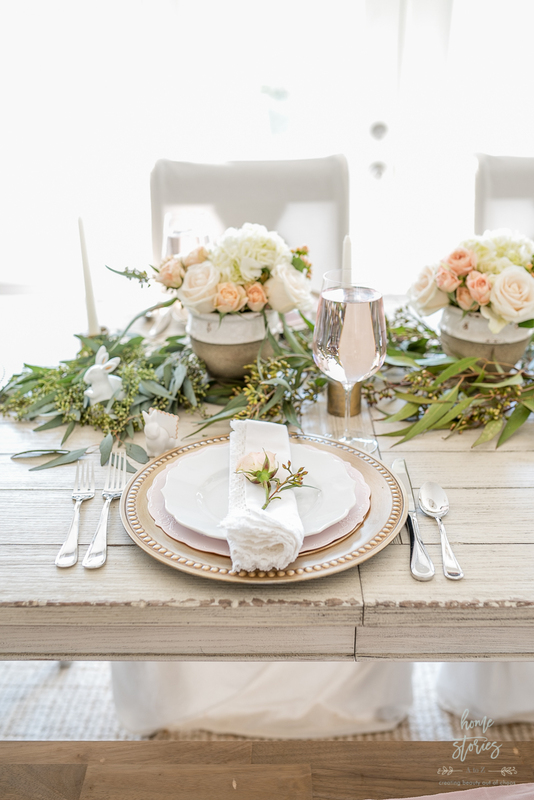 Spring Table Decorating Tip 4: Don’t be afraid to mix in affordable plastic or melamine dishes with real dishes. I create a lot of different tablescapes in all sorts of colors and themes. 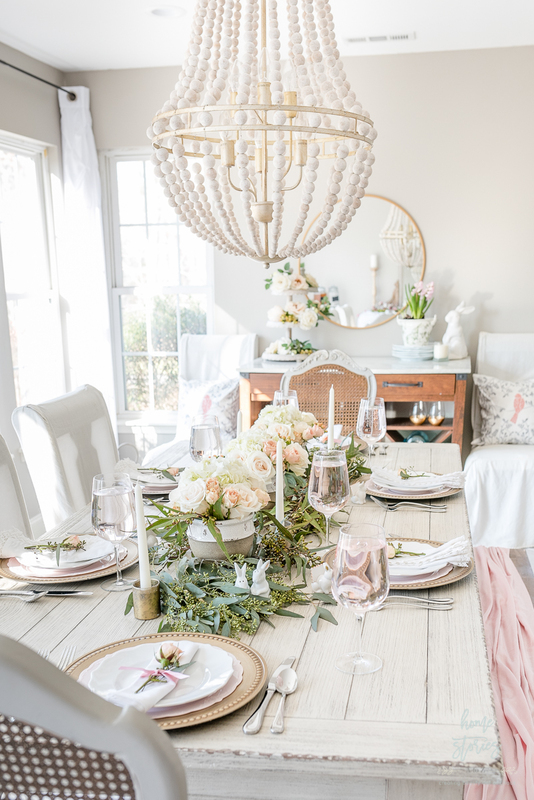 I love interjecting color into the table with pretty dishes; however, I do not have an endless budget or endless storage space for all of those pretty dishes! Incorporating inexpensive disposable plastic dishes is an affordable way to get the look for less. 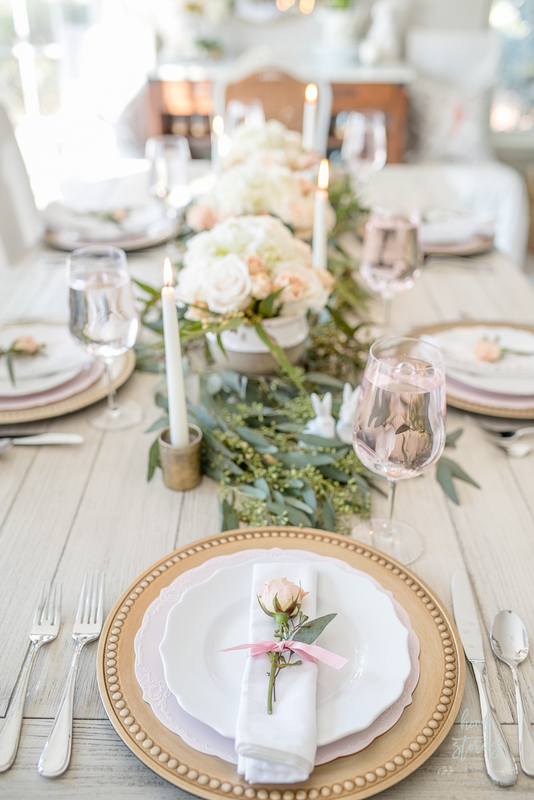 I used a packet of blush-colored, plastic dinner plates I found at HomeGoods to get the look I wanted. 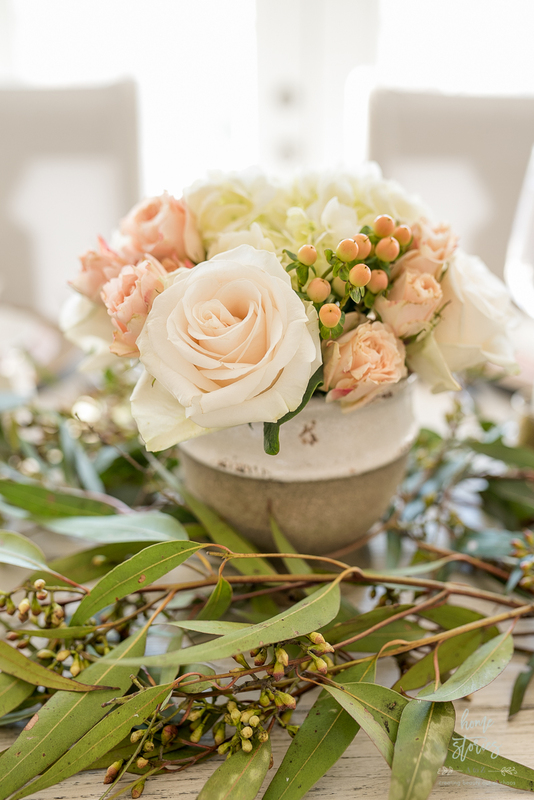 Spring Table Decorating Tip 5: Personalize each place setting with a special detail. Place cards at each setting aren’t necessary, but they do make your table feel more thoughtful and personalized! I found these cute bunny place card holders in Target’s Dollar Spot last year. 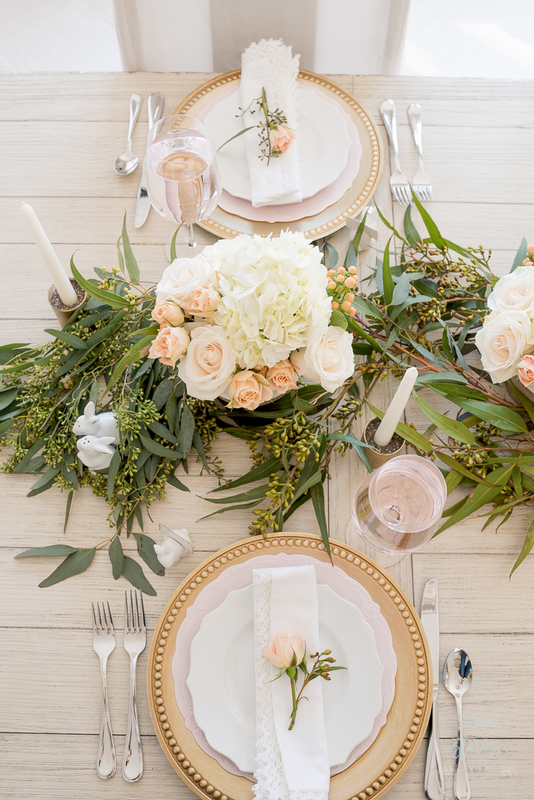 Using a single flower with some ribbon is also a simple way to elevate even a paper napkin! To shop or find sources for products featured in this post, please click on the links (affiliate where pertinent) below. Wall paint color–Custom color by previous owner’s but (in my opinion) very similar to Sherwin Williams Agreeable Gray. 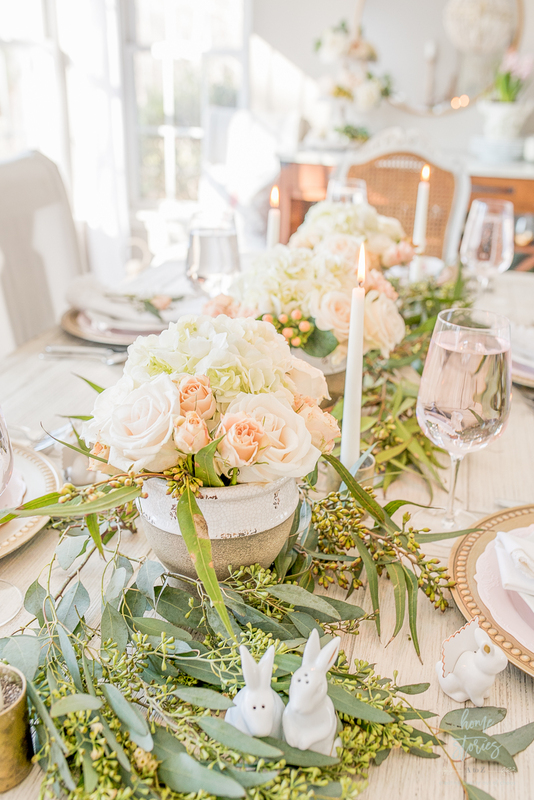 I hope these simple tips have inspired you to think outside the box when entertaining this spring! 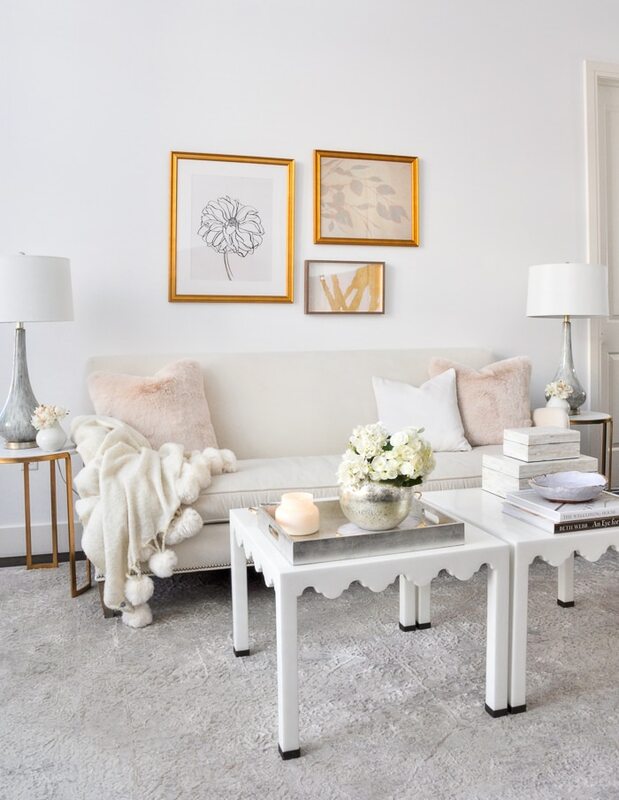 For more spring decorating inspiration, be sure to visit my amazingly talented blog friends below! Next on your stop is Cami from Tidbits. 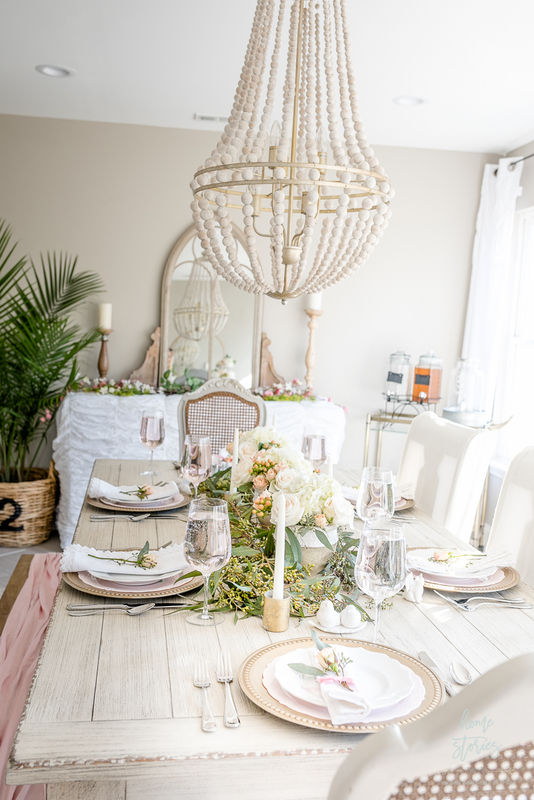 Such a gorgeous table setting, Beth! I love all the light colors and beautiful flowers. 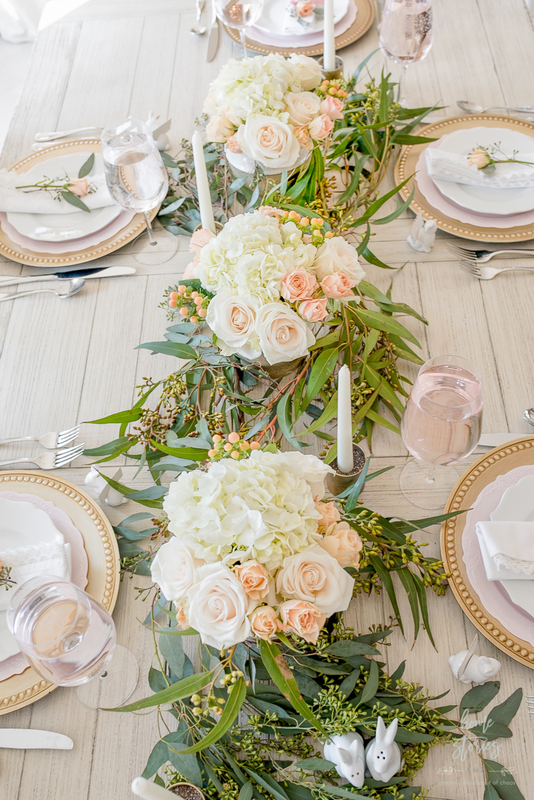 Such a gorgeous table setting, Beth! I love every detail! Your table is absolutely stunning as are you. Love the clever votives as candle holders as well. Beth I am so fond of your dining room at any time of year, but right now it’s even more gorgeous! 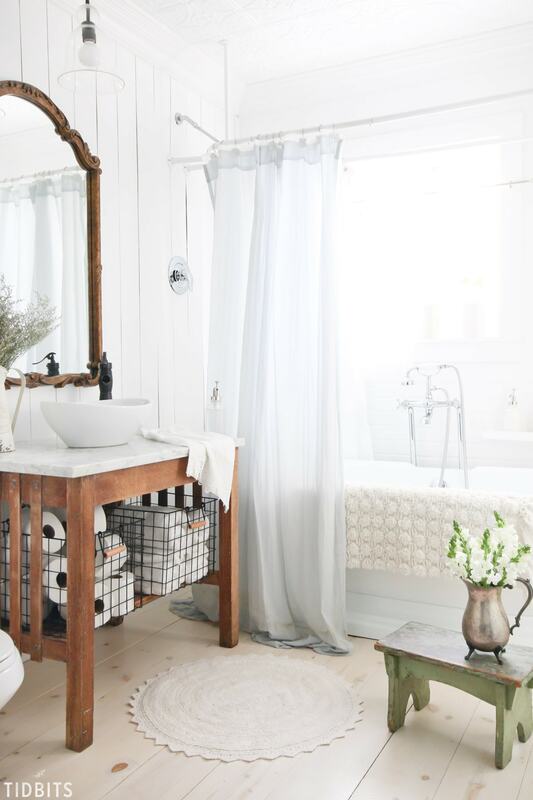 I love, love, love that floral runner! Just absolutely gorgeous – and I’m going to check out the little planters/vases- they are so cute! Thanks so much for joining us, and happy spring to you! Thanks so much for having me Sheila! It was fun to create this beautiful table! It’s all so beautiful and romantic Beth! 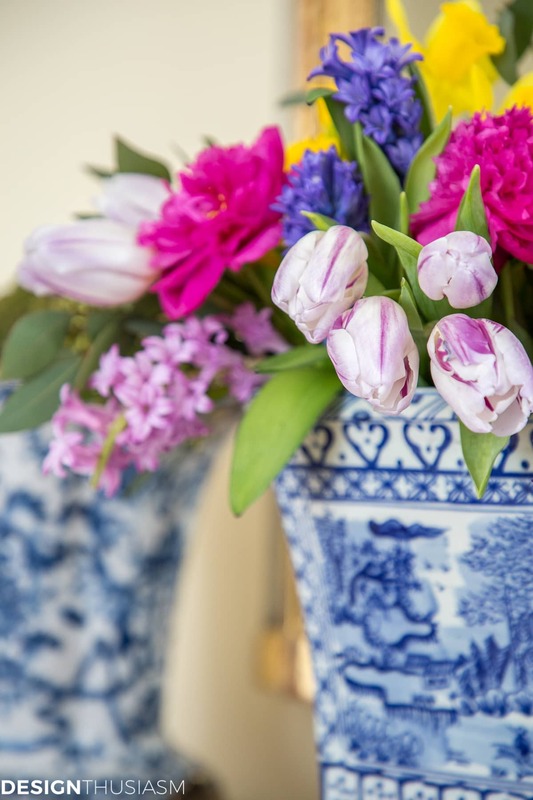 I love those pots that you’ve used for the floral arrangements. Gorgeous! Thank you! They were so perfect and such a steal at under $5! Your table is absolutely beautiful! Love the small pots you used for floral arrangements. I was pleased to see they are inexpensive. Did you use 5” or 7” pots? Great remark about guests needing to see over the arrangements for conversation. What is the point of centerpieces if the have to be removed from the table? Thank you for the inspiration! Thank you so much Penny! I used the 5″ on the table.